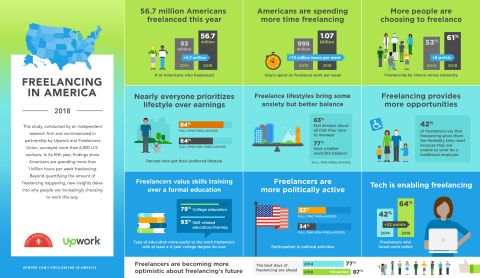 NEW YORK & MOUNTAIN VIEW, Calif.--(BUSINESS WIRE)--Upwork ($UPWK) and Freelancers Union today released the results of “Freelancing in America: 2018” (FIA), the most comprehensive measure of the U.S. independent workforce. The fifth annual study estimates that 56.7 million Americans freelance, an increase of 3.7 million in the past five years. Full study results are available here. Americans are spending more time freelancing: Average weekly hours spent freelancing increased 72 million hours per week from 998 million in 2015 to more than one billion hours per week of freelancing this year. Technology is making it easier to find work: 64% of freelancers found work online, a 22 point increase since 2014. Lifestyle matters most: Both freelancers and non-freelancers prioritize achieving the lifestyle that they want but freelancers are more likely to get it. 51% of all freelancers say no amount of money would get them to take a traditional job. Freelancers are more politically active: In this election season, freelancers indicated they are 19 points more politically active than non-freelancers. More than seven in 10 (72%) said they’d be willing to cross party lines to vote for candidates who support freelancer interests. Freelancers place more value on skills training: 93% of freelancers with a four-year college degree said training was useful versus only 79% who said their college education was useful to the work they do now; and 70% of full-time freelancers participated in skills training in the past six months compared to only 49% of full-time non-freelancers. "The 2018 Freelancing in America report demonstrates the remarkable growth of the freelance workforce over the past five years," said Caitlin Pearce, Executive Director of Freelancers Union. "Freelancers are the backbone of our economy but this crucial segment of America's workforce faces unique challenges, including access to affordable healthcare and workforce development training to update skills in a competitive environment. They're more politically active than the general population, and they're looking for policymakers to take notice." More than one in three (35%) Americans freelanced this year. The freelance workforce grew from 53 million to 56.7 million, or 7%, in five years. The non-freelance U.S. workforce meanwhile grew just 2% (from 103 million to 105.3 million) in five years, making the freelance workforce’s rate of growth much faster. Over the last five years, people are increasingly starting to freelance by choice. Asked whether they started freelancing more by choice or necessity, 61% of freelancers said by choice -- up eight points (from 53%) since 2014. This is driven especially by growth among younger generations and full-time freelancers (as opposed to part-time freelancers). The younger generations are freelancing more than any other generation in the workforce, and full-time freelancers now make up 28% of freelancers (up 11 points since 2014). Freelancers are more likely to find skill-related training valuable to the work they do now rather than a college education. Freelancers are more proactively updating their skills to remain marketable as the job market evolves compared to non-freelancing workers - 70% of full-time freelancers participated in skills training in the past six months, compared to 49% of full-time non-freelancers. Specifically, freelancers are seeking training to enhance their skills in areas that affect freelancers most: technology, networking and business management. Cost is a barrier for many (53%) freelancers to accessing training, particularly because freelancers are more likely than non-freelancers to pay for training themselves. Both freelancers and non-freelancers prioritize achieving the lifestyle that they want but freelancers are more likely to get it. Freelancers feel anxious about all they have to manage but they also have a better work-life balance with more control over one's own destiny and schedule, resulting in less stress and better health. 42% of freelancers agree that freelancing gives them the flexibility they need because they are unable to work for a traditional employer because of personal circumstances (health issues, childcare needs, etc.). 61% of full-time freelancers would consider moving to a different city for a tax break of less than $5,000. In this election season, freelancers could be very important to results – they are 19 points more politically active than non-freelancers. Freelancers are more likely to vote for candidates who support their interests. In fact, having their issues addressed by their representatives is more important to freelancers than party loyalty. More than seven in 10 (72%) said they’d be willing to cross party lines to vote for candidates who support freelancer interests. To win freelancer voters, candidates should focus on making healthcare more affordable and accessible as well as supporting retirement savings and higher pay. More than three in four report that technology has made it easier to find freelance work. The percentage of work they obtained online increased for 67% of freelancers this year. Freelancers are optimistic about the future of freelancing – nearly nine in 10 see the industry’s best days ahead. 51% of freelancers say no amount of money would get them to take a traditional job. To see further insights, please visit here for access to the full results deck and other materials. The study is conducted by independent research firm Edelman Intelligence. 6,001 U.S. working adults over the age of 18 were surveyed for it online between June 21, 2018 - July 12, 2018. Of those, 2,100 were freelancers and 3,901 were non-freelancers. Results are weighted to ensure demographic representation in line with the United States Bureau of Labor Statistics’ 2018 Labor Force Statistics from the Current Population Survey and the American Community Survey. The study has an overall margin of error of ±1.2% at the 95% level of confidence. Upwork is the largest global freelancing website. It enables businesses to find and work with highly skilled freelancers. As an increasingly connected and independent workforce goes online, knowledge work—like software, shopping and content before it—is shifting online as well. This shift is making it easier for clients to connect and work with talent in near real-time and is freeing professionals everywhere from having to work at a set time and place. Our company’s mission is to create economic opportunities so people have better lives. Freelancers Union is the largest and fast-growing organization representing the millions of independent workers across the country. It gives its 400,000 members a voice through policy advocacy, benefits, and community. Since its founding, Freelancers Union has fought for and won protections for freelance workers, including Unincorporated Business Tax reform and successfully advocating for new models for health care. In 2016, Freelancers Union led a victorious campaign to enact first-of-its kind legislation in New York City giving freelancers unprecedented protections from nonpayment. Learn more at www.freelancersunion.org.